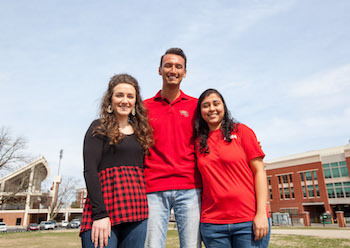 Mackenzie Pennington, Apeksha Joshi, and Stephen Mayer are three WKU students on the Tobacco-Free Taskforce actively working to educate students and gain their support and input for WKU becoming a clean air campus – moving from designated smoking areas to tobacco free. Currently, WKU has 12 designated smoking areas on campus. Last year, WKU created a taskforce to put together a tobacco-free policy. While faculty and staff from various departments serve on the committee, the involvement of student representatives on the committee remain important. Joshi and Pennington, a graduate student from Glendale, KY, both began organizing and participating in student events last year to promote a tobacco free campus. During the 2018 homecoming tailgate, the Great American Smokeout, and Tobacco Free Tuesday, Pennington, Joshi, and WKU KPHA members received input from students and provided helpful resources. While Pennington and Joshi actively work with KPHA to organize events, Mayer, a junior from Louisville, KY and Student Government Association president, continues communication with representatives of the student body through the SGA. “During my time on the Tobacco-Free Taskforce, I have engaged in many conversations with students in regards to becoming a ‘tobacco-free campus.’” Mayer said. “My goal, as an aspiring surgeon, is for everyone to be in the best state of health they can possibly be in. The intentions of this newly introduced policy is to educate the WKU community on the health risks of smoking and second hand smoke.” The policy is expected to be presented to the Board of Regents at the May meeting. The tobacco-free initiative is supported through a partnership with the American Cancer Society, Foundation for a Healthy Kentucky, and the Barren River Area Health Department. To learn more, visit wku.edu/tobaccofree.